Microsoft’s Outlook Web app for Android. On Monday, Microsoft launched a number of features that should dramatically improve the usefulness of its Outlook Web app, including an Outlook Web app for Android and a "decluttering" tool for your inbox. Specifically, Microsoft announced a "clutter" tool, OWA for Android, and new, streamlined collaborative editing tools that tie the Office Web apps like Word directly into the email experience. Microsoft also said it extended the concept of its Yammer groups across Office 365, into Outlook as well. All are coming "later this year," Microsoft said. Microsoft made the announcements at its Microsoft Exchange Conference, taking place in the days before its Build developer conference launches later this week. "There is no denying that businesses depend on email more than any other digital communication medium," Steve Chew, a product manager for Exchange," wrote in a blog post. "The downside of email's popularity is that people receive so much of it that they often experience inbox overload and email fatigue. Email is also a highly versatile tool, so it gets used in situations where it is not the optimal one, like when people collaborate on a document by emailing multiple--and often conflicting--versions around. Lastly, email makes it easy for people to have private conversations, but these conversations don't provide visibility to people outside of the recipients who could benefit or contribute." From a financial sense, the Outlook Web App for Android could serve as a cheaper alternative to Android solutions like TouchDown HD or Samsung's Knox, which create virtual lockboxes on an Android phone to store secured corporate data. When an employee leaves the company, those data stores can be remotely erased without interfering with the user's personal data. Microsoft previously launched OWA for iOS devices, including iPads and iPhones. However, Microsoft's decluttering tool could save something more important: time. Microsoft is defining clutter as somewhat more important than outright spam, but not something that needs to be acted upon, such as a notice about a fire drill in a remote office. A new tool for the Outlook Web app will "sweep" user inboxes clean of this clutter, giving users the opportunity to review the "clutter" in its own distinct location. And, like most spam tools, if an email is accidentally labeled as "clutter," a user can move it into email that he or she sees in the future. So how does Microsoft determine clutter? Automatically. "Leveraging the intelligence of the Office Graph, clutter looks for how 'importantly' or 'unimportantly' you treat emails and looks for patterns behind those behaviors," Chew wrote. In other words, if you consistently ignore emails about volunteering to pick up trash around the neighborhood, Outlook's Web app will treat those as clutter and bury them. Microsoft also said it would improve how attachments are handled via email. Microsoft executives noted that collaboration via email can still be frustrating, especially when users send around their own versions of a "shared" document, whose changes must be integrated. With a new collaboration tool due later this year, the Office Web app (on a PC or tablet) will open up the Word Web app next to an email that contains a document. From one screen, users will be able to email a response as well as work on the shared document. And, once changes are made, two versions of the document will be emailed back: the original draft, and the new version, with changes. When users email out their own Word, Excel, or PowerPoint documents, they'll have several options: attach a file from their own computer, or attach a file from the new OneDrive for Business (whose standalone offering launches on Tuesday, Microsoft said). In either case, they can either attach the document directly, or else attach a link if it's stored in the cloud. Moreover, they'll also be able to set permissions. And if the document is stored in the OneDrive for Business cloud, there will be the option to work and edit it online collaboratively. Earlier this month, Microsoft outlined its shared, social vision of a future Office 365. Microsoft took a second step toward that by integrating groups formed in Yammer with Office 365. Users who create those groups will now see them within the Office Web app. Grouping is also now represented within the Calendar view, so that users can create, edit and share calendar items just as they would other documents. And group calendar items can be pushed to the personal calendar view with just a single click, Microsoft said--apparently, this isn't on by default. Microsoft also tipped some of its other plans. "[At] this week's conference, we'll also talk about how we'll continue to invest in built-in security and compliance features like archiving, eDiscovery, DLP, and encryption," Jeff Teper, the corporate vice president of Office and the Office Servers group, said in his own blog post. "We will continue to make these capabilities in Exchange more and more robust. We're also expanding these capabilities to other products like SharePoint and Lync. We're unifying the concepts across Office, so our customers won't need to manage them in separate places." 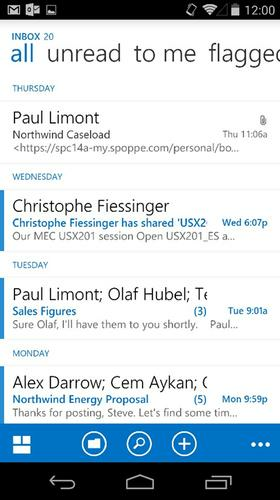 For now, however, beefing up the oft-overlooked Outlook Web app is a good start.